Get More From Your Groceries – We often waste parts of the plant that are packed with flavor and nutrition. BANANA PEELS are packed with vitamin A, lutein, B vitamins, and antioxidants and have tons of soluble and insoluble fiber to slow digestion, boost fullness, and lower cholesterol. Skins from green bananas can be cooked as a bell pepper. Add to stir-fries, curries, and tomato sauce. Skins from ripe bananas can be eaten raw. Remove the stem and put a whole banana in your next smoothie. BEET GREENS are more nutritious than the roots, with lots of calcium, phytonutrients, and betaine, supporting healthy blood circulation. Young beet greens are tasty raw. Older leaves are delicious steamed or sautéed. CANTALOUPE SEEDS are a source of fat, protein, and minerals like calcium, iron, magnesium, phosphorus, and potassium. Put them in a smoothie, or roast them. CARROT TOPS can be used instead of lettuce on your sandwich or blended into a smoothie. The greens have six times more vitamin C than carrots and are rich in vitamin K and magnesium. CAULIFLOWER AND BROCCOLI STEMS are healthy and mineral-packed. Peal the tough exterior, shave it into ribbons, and cook into pasta or slice stalks into sticks and use for dipping. Use the huge leaves around the heads by cutting them into ribbons and serving them as a salad, dressed with warm vinaigrette. CELERY LEAVES taste like the stalks but have more concentrated flavor, and more calcium and magnesium. Use how you’d use celery. CHARD, COLLARD, AND KALE STEMS – Stems have as much nutrition as the leaves. They are rich in glutamine, an amino acid that boosts the immune system and helps muscle recovery after a workout. CORN COBS have as much flavor as the kernels, and boiled for 10 minutes, the flavor is released. Use the corn stock for chowders or soups. FENNEL STALKS, FRONDS AND FLOWERS – All of the plant is edible. Chop stalks and add to soups or sauces; add whole to soup stocks; add to garlic, olive oil, and nuts for a pesto. Fronds are chopped raw as a garnish, or in salads. Try with fresh dill tossed with buttered spring potatoes. Flowers have a lovely licorice flavor. Snip fresh flowers and serve with fish, toss with pasta, and in salads, or dry the flowers and rub off the florets to make fennel pollen—a licorice-y spice for seasoning meats or tossing with pasta. ORANGE RIND – More nutrients are in the peel and seeds than the fruit. Grind seeds to sprinkle on yogurt. Rub the pith on your teeth for a whitener. Steep in tea, or grind to powder and mix in spice rubs for meats. Air-dry slices of peel, or spread them on a lined baking sheet at 170 degrees for about 1 hour. FRUIT SKINS – Ferment peach, plum, apple, or apricot skins and use the vinegar as a tonic with seltzer, as a marinade, or in salad dressing. GINGER SKIN – Whenever you peel ginger root, save peels and steep in water to make tea, or add to olive oil to make ginger-tinged salad dressings. HERB STEMS have the same flavors as the leaves, and can be added to salsas (cilantro) or pesto (parsley) or steeped in teas (mint). LEEK GREENS – Add the tougher, dark greens to stock, or soups and stews to flavor. They thicken broth. Crispy fry them, or make pesto. MUSHROOM STEMS – Some varieties are too fibrous to taste good when raw, but sautéed or boiled, they are tasty. ONION SKINS – Great for vegetable stock and make a pungent tea, rich in antioxidants. Steep skins in boiling water a few minutes. The longer it steeps, the stronger the tea. PINEAPPLE RIND AND CORE – Simmer the rind and core in water with a few spices (ginger, cinnamon sticks), and chill to make a refreshing tea. RADISH LEAVES contain more vitamin C, calcium and protein than the radish. Toss leaves in a pesto, stir-fry, sauté, or add to a green smoothie. Green Onions – Put some with roots in a sunny spot in rich soil in a pot or in the garden and keep moist. They re-grow quickly! Carrots – Cut the tops off leaving an inch of root and plant in rich moist soil. Celery – Rinse the base off and put it in a small bowl of warm water on a sunny windowsill. Change the water every couple of days, and spray the base with water where leaves are growing out. 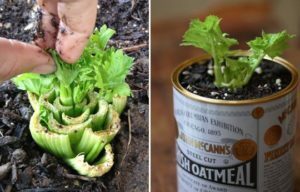 After a week transfer celery to soil and cover, except for leaf tips. Water generously. Sweet Potatoes – Use a firm sweet potato that’s starting to sprout and place it in a jar of water. Allow a couple inches to be above water. Change water occasionally to prevent molding. Place the jar in a sunny spot. When sprouts are four to five inches long, pull them off and place them in water. When sprouts are rooted, plant in a hill of soil about 10 inches high. Keep watered while roots are being established. It will take several months of growing before the first frost to form tubers. Bok Choy – Place the base face up in a small bowl of warm water. It may begin to regenerate quicker than your celery. In a few weeks, transfer it to soil. Avocado – Wipe the pit off. Push four toothpicks into the side of the pit and place pit over a glass of water with the toothpicks resting on the rim and the pit suspended over the center. Make sure pointy side is up and pit submerged about halfway. Change water every other day, and be sure pit is sitting in water. Keep on a sunny windowsill. Once the plant is about 7 or 8 inches tall, snip off the top few leaves to encourage more growth and plant in soil. Ginger – Root should be plump with tight skin and have a few eye buds on it. If they’re a little green, it’s even better. Soak root in warm water overnight. Place root with the eye bud up and cover with 1 to 2 inches of soil; water well. Put ginger in a spot without much bright sunlight, but fairly warm. Spray to keep the soil moist. In several weeks shoots pop out of the soil. Harvest 3 to 4 months after growth begins.